CALAIS, France (CNS) — The month of March is heavy with rain in Calais, France, and migrants find a warm refuge in Caritas’ day shelter. In the shelter’s spacious common room, migrants take a break from living outdoors to sleep, charge their phone and cut their hair, but also play board games on the long wooden tables. Migrants feel safe from the police who prevent them from attempting to reach the U.K., too — safe enough to talk about alleged police violence on the radio. Calais is a key European port where ferries, cargo ships and speed trains move people and goods between France and the United Kingdom. For two decades it also has been a primary transit spot for migrants and, at the height of the so-called European migrant crisis in 2016, nearly 9,000 people lived in a makeshift camp notoriously named “The Jungle.” Today, according to government data, 400 people in Calais are waiting for their chance to cross one of the busiest maritime passageways in the world. Since The Jungle got dismantled, migrants have slept in the woods for fear of being caught by the French police, which may lead to arrests or dispersion, or, according to migrants, physical abuse. “We wanted to let them feel like they exist through any means possible,” Veronique Pigeon, a volunteer at Caritas, told Catholic News Service. During the day, nearly 200 people meet at Caritas, where they drink tea, delve into the arts or play music. Unlike videos or articles, the radio grants migrants a voice and anonymity. No names, ages, or nationalities are allowed on air. “Some journalists have betrayed them,” Pigeon said, by “promising not to share their photos and doing it anyway.” By word of mouth, the migrants told each other to distrust the press. Since then, “they no longer want their photos taken,” she added. Former persecutors may know their location, and asylum officials may misinterpret their story if they are identified online. The topic of each week’s radio show depends on current events. One week, the theme was police abuse. After volunteers looked for speakers among migrants, two agreed to share their story: Haile, from Ethiopia, and Moussa, from Mali. These are fictitious names. On March 12, the police had dismantled a migrant’s camp and, according to Caritas, operations like these are multiplying. “I was sleeping outside when the police came and gassed us, hit us and forced us on a bus and drove us very far away,” Moussa said on air. Following orders, the police pick up migrants and drive them to shelters 70 miles from the coast to dissuade them from crossing the Channel. “I come from one of France’s colonies and I’m scared of France,” Moussa added. “We are humans, and I ask myself, does democracy really exist?” he said. But for the administration that gives orders to the police, the officers’ actions operate within a legal framework. Haile, however, wants to be able to plead for asylum in France, which is not possible under EU regulations, since his fingerprints were taken in Germany. “We want the government to propose solutions,” Haile told CNS. “And try to negotiate with refugees.” Haile asked Caritas to lobby the French government to change European asylum laws. “The Catholic Church still has a lot of influence on French politics,” he said. 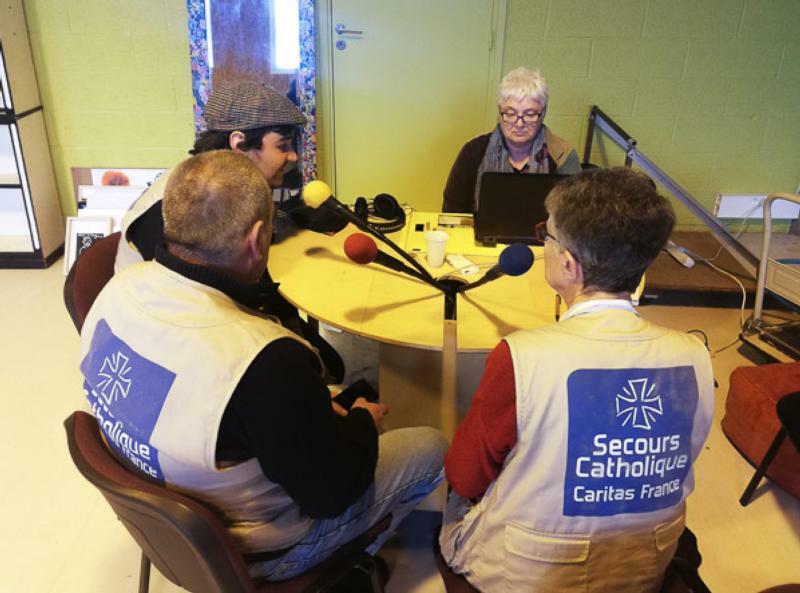 In an atmosphere where people mostly talk about elementary needs, “the radio allows them to talk about deeper topics,” Fabienne Deguiles, a volunteer at Caritas, told CNS. “We develop a relationship of equals.” For her, having a concrete time and meeting spot also helps rapport grow. When migrants stop arriving at the shelter, Caritas volunteers believe that the person has either successfully reached the U.K., was arrested, or died attempting the journey at sea. Since November 2018, more migrants have been hopping on inflatable boats to sail across the English Channel. With Brexit looming, migrants believe their chances of crossing the border are slimmer. The rumor has been created, or reinforced, by people smugglers, who allegedly make them pay between 3,000 and 6,000 euros to use dinghies. This year, the organization has intercepted more than 26 dinghies. Between the time migrants arrive at Calais and decide to leave, they rest at the only day shelter in town and may find their voice through the radio. Sometimes, a person who achieves the migrant dream — to reach the U.K. for asylum or for work — calls in to thank the Caritas team. One of them has even pledged to help the radio grow.